Everyone needs a mirror. You know what's even better than a regular mirror? A lighted mirror with magnification! 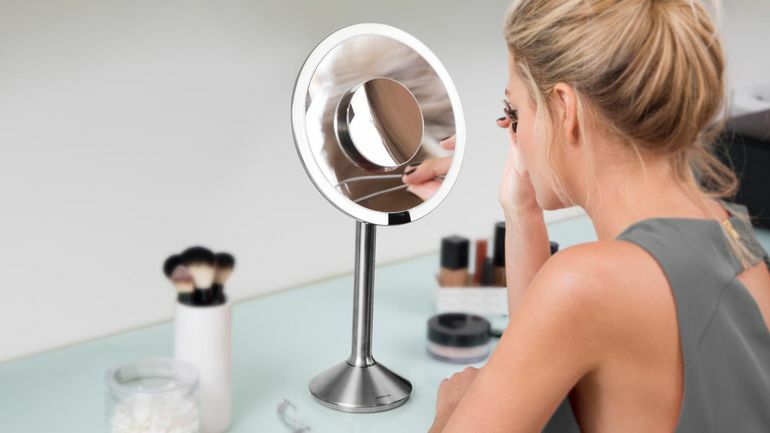 Helps you shave, do makeup, tweeze… everything a mirror does, but now a million times better. We know how tasking it can be to look for a mirror that suits you perfectly but that's why we are here. 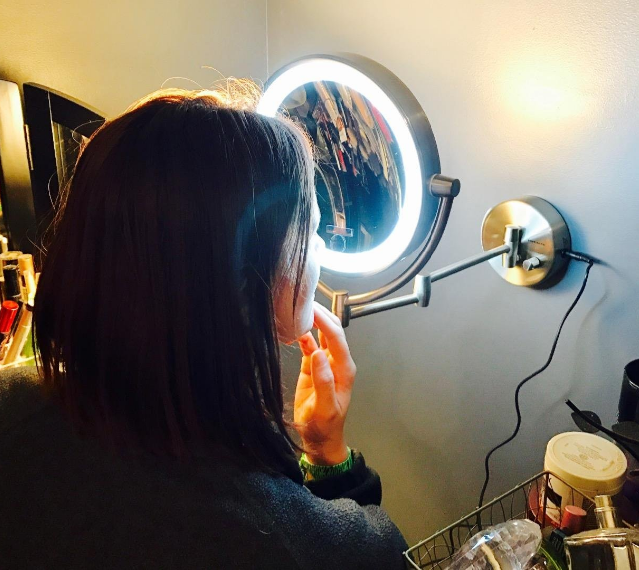 Have a look at the best-lighted makeup mirrors around. This S﻿imple﻿human model is simple looking but don't let that fool you. It is one of the best-lighted mirrors around. It offers you 5X magnification and yet it's huge-9" in diameter, you can get your whole face in and then some more when you tilt it. It has a five year warranty while most mirror companies offer a warranty of between 1-3 years. The Tru-lux LED light system loosely simulates natural sunlight. 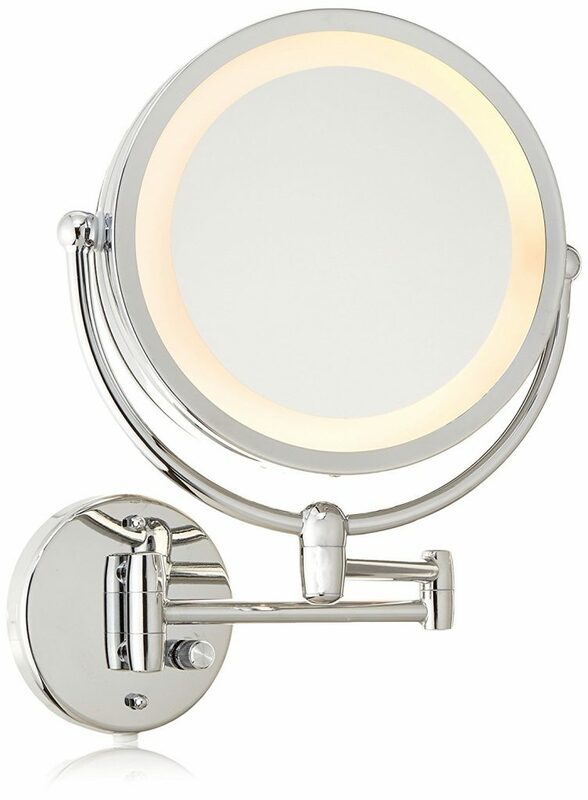 It is twice as bright and more color-correct than the next best vanity mirror. Must be from the 600 lux and a color rendering index﻿ (CRI) of 90. There is no distortion; the curvature is precise for distortion-free optics even around the edges. It has maximum adjustability from 15"-18". The mirror tilts back fully to always provide a clear, comfortable view even while standing up. It also rotates at least 180 degrees horizontally and rotates vertically too. The ultra-clear high-quality glass backed by high purity aluminum coating provides superior reflectivity and clarity. The mirror is rechargeable using a standard USB port. Don't worry, the cable and adapter come along with the mirror. The charge lasts up to 5 weeks. There is an LED indicator to tell you when it needs charging and when it's done charging. It has a sensor that automatically lights up the mirror as your face approaches. This makes it a hands-free mirror. Kind of cool right? During use, it becomes more sensitive so it won't turn off. 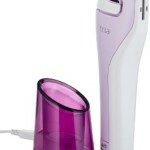 It is cordless meaning you can easily move it around and travel with it. When it comes to durability, the light ring won't degrade or diminish for years! A weighted base means it won't tip over and yet it's a little over 4.5" making it a small footprint. The on/off sensor can be a nag. If you move away to grab something it switches off and you have to wave your hand to turn it back on. A manual override to defeat sensor. For its price it should have come with an anti-fog feature. It is one of the priciest models around but it's worth it. I would rate it the best if you can afford it. These is one of those U.L and ETL tested and listed lighted mirrors so it should be good. Well… yeah, it's pretty impressive. All Danielle mirrors are precision made with the highest quality optical glass and this one is no exception. The mirror is wide-8 inches to be exact. 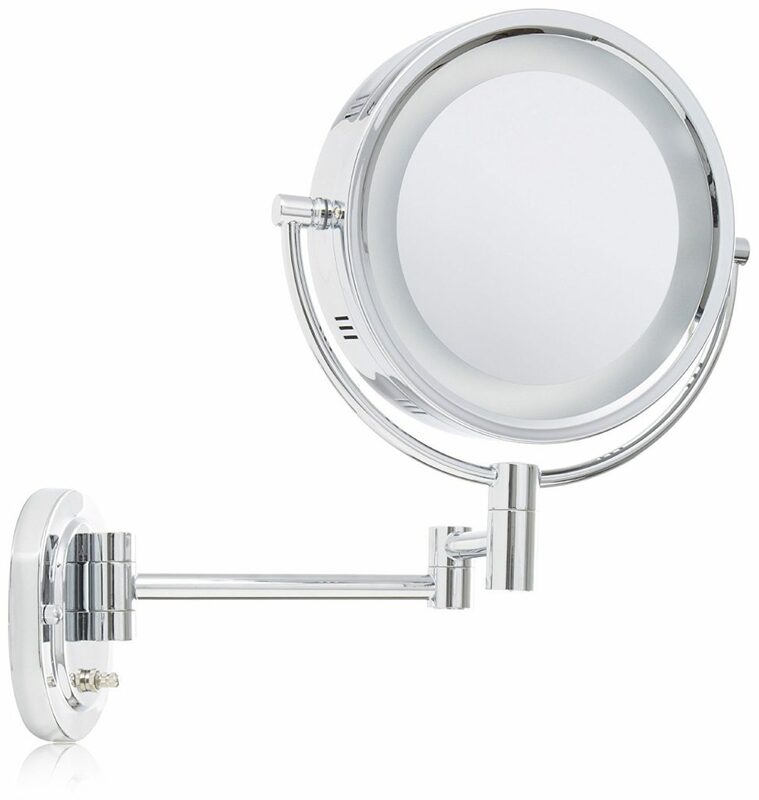 The arm extends out to 13 inches plus the mirror is fully adjustable to view any angle. It is Double sided, one side normal while the other has a powerful 10X magnification. The sleek chrome finish makes it look classy and modern, and of course it definitely adds some elegance to any room. Kudos to Danielle for the excellent construction and finishing. The halo lighting on this lighted mirror is pretty amazing. There is also incandescent lighting with dual settings to simulate both evening and daytime. You also get undistorted viewing. It has a fog free feature which makes it perfect for your bathroom. Installation is so easy you will be shocked. If it takes you more than 10-15 minutes, your household skills are whack. 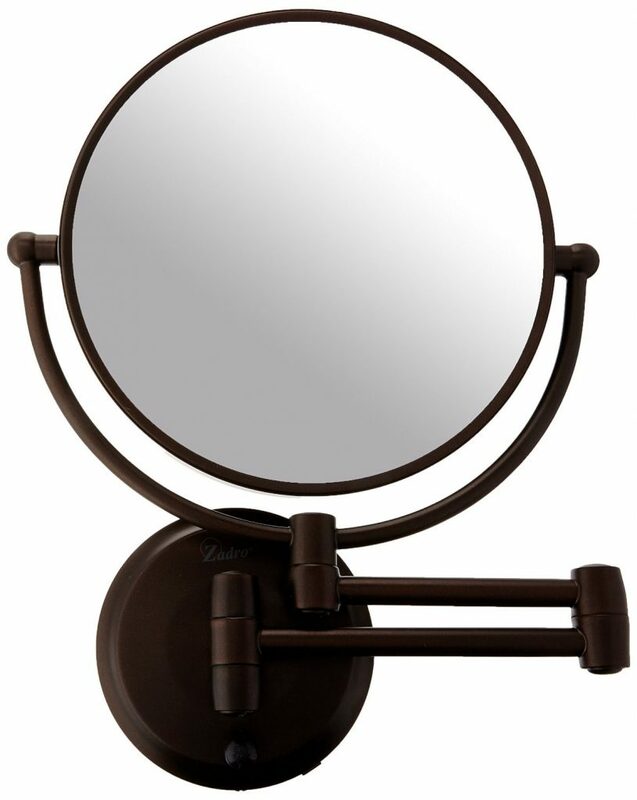 It is a very sturdy mirror but the swivel arm is easy to move. The Philips head screw at the bottom can be made tighter or looser to give the desired swivel effect. It is one of those durable mirrors; it will serve you for years. The mounting cords are long (30") which is a good thing when you need to reach a distant outlet but not so good when you don't. However, you can still shorten them but if you are a little blond in that area get somebody to do that for you so that you don't mess everything up. All you need is some hand tools, wire steppers and connectors. You can also hardwire it to the wall and eliminate the cord completely. A cord cover also works. The incandescent lighting is not as bright as LED lighting. Plus it gets hot and can burn if one is not careful. This mirror makes you feel like your bathroom is a luxury hotel or spa. The 10X is especially ideal for older folks and people with poor eyesight. The Zadro is simple yet classy. It is a 7-inch dual sided mirror with 10X and 1X magnification. The 10X magnification (concave) is great for touch-ups, detail and makeup application while the 1X side is perfect for styling hair, cosmetics etc. The dual-jointed arm extends up to 12 inches. With such a great-looking finish, it will be love at first sight. You will also enjoy the quality optical glass on this lighted mirror. It makes use of LED technology which is not only energy saving but is also pretty bright. The lifetime LED bulbs never need replacement. When it comes to brightness, many love the fact it's that bright and yet it isn't blinding to the eyes. It is cordless meaning you can mount it wherever you like including the bathroom. Having cords in a wet bathroom can be a safety issue too. Battery life is about six months which is pretty great. Must be because it consumes less energy by 70%. It uses 4 C Batteries (which are not included) or a power adapter (included). It is easy to install; it comes with drywall anchors, screws and washers. Lastly, just like all mountable mirrors it saves lots of counter space. This mirror might not be as durable as some other models in the market so you must be extra careful when using it. It is also a little on the heavier side so must be adequately mounted. The 10X magnification makes this model great for people with poor eyesight and the elderly. If you can withstand the 10X magnification, go for it. One word for the design on this mirror - Elegant. Everyone loves the Stylish Oil-Rubbed Bronze finish. The bronze finish matches most bathroom fixtures. 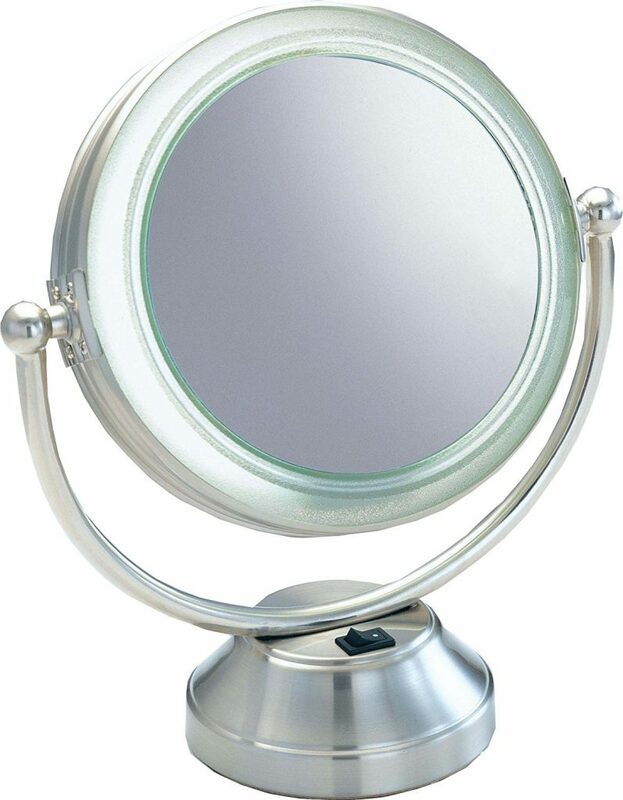 This is a double sided mirror with two magnification setting: 1X and 10X magnification. The arm is up to 11 inches and you can extend as you wish. This mirror comes with a 1-year warranty. It also comes with a halo light design that you can turn on/off as desired. Got to love that! Durability assured! Brass is pretty long-lasting while the long-lasting built-in 50 pieces LED strip meaning you need not do any bulb replacements. The variable swivel adds to functionality and ease of use. It comes with a power cord length 5 feet that plug into a nearby outlet which you could easily hardwire if you don't like plug. It is easy to mount especially because it comes with all the necessary hardware. You have to be not more than 2 inches away from the 10X mirror to have a pleasant view. This is not adequate especially when using brushes. It is very heavy so you might have to attach wood studs, the drywall doesn't look like thy can hold up over an extended period of time. 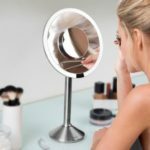 The GuRun is a quality mirror that is ideal mirror for makeup application, shaving… practically everything you would ever need from a mirror. If you can afford it, go for it. From first glance it resembles the GuRun but it's different in a couple of ways. 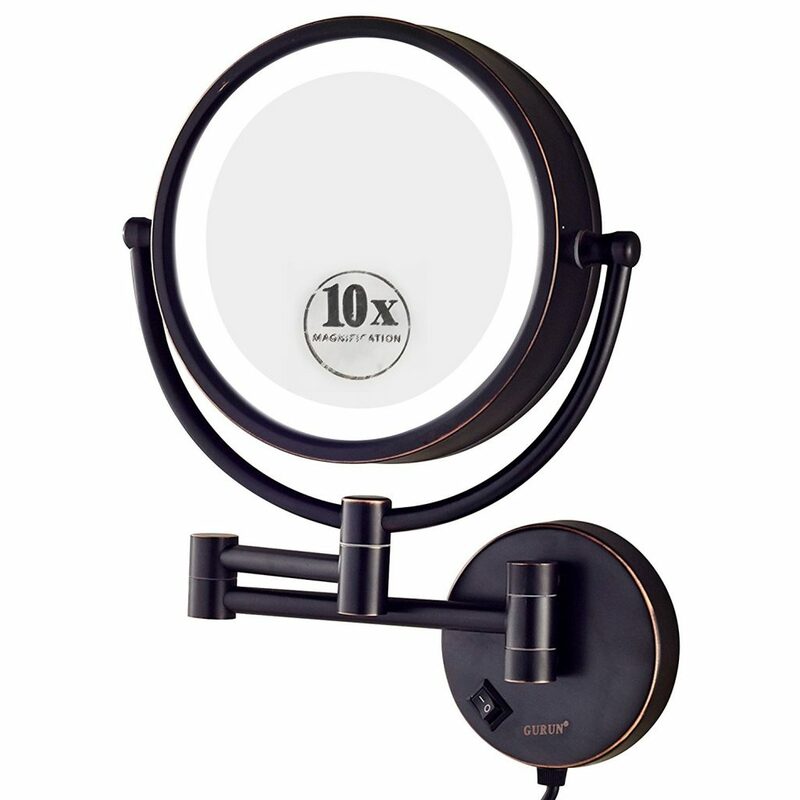 The Zadro 10X Double Sided Round Wall Mirror is elegant-looking like the GuRun and has similar magnification- 1X and 10X. The mirror is 7" (9" if you count the light ring surrounding the mirror). The arm extends up to 12". Did I forget to mention the arm is super flexible? You will fall in love with the oil-rubbed bronze finish that fits just right with almost any décor. Looks pretty classy and fabulous. 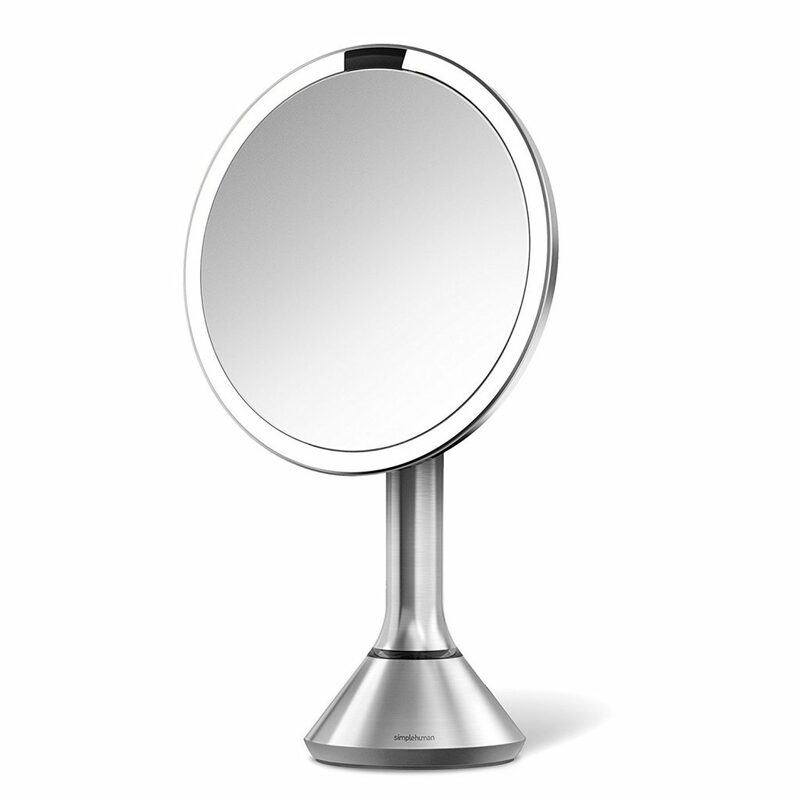 This is a cordless mirror, (meaning it can be used anywhere in any room whether there are sockets or not), that makes use of 4 C batteries although they are not included in the package. You could also go with a power adapter. The batteries last long because of the energy saving LED bulbs. The lighting? Beautiful. Bright light that gives off a beautiful glow. Plus, you have the option to keep the light on or off. The mirror is very flexible. You can use it seated or standing up. It extends, moves and flips. The Zadro 10X is easy to install, just about 15 minutes and voila it's done. Changing the batteries is a tad tasking; you have to undo three small screws to do it and afterward line them up again but since they last long and you with the plugin option you might not have to go through such inconveniences at all. The lighting may not be as durable as they claim. 10X magnification is good to see every little imperfection and get makeup right. This is a clear distortion free mirror. It doesn't get better than this, if the specs are what you are looking for. 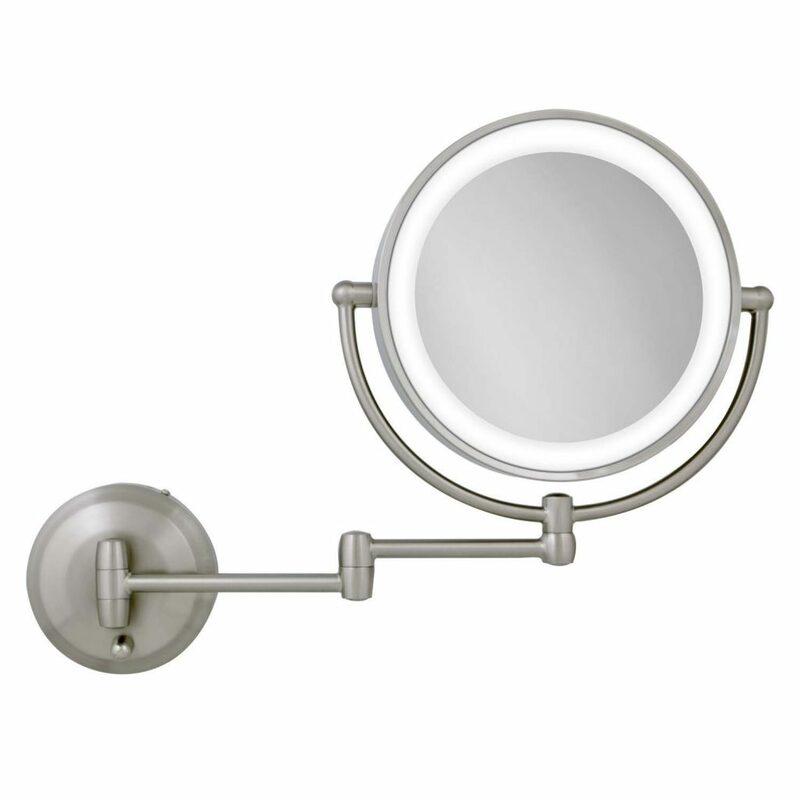 The Jerdon HL65C is a circular two-sided mirror is 8-inch in diameter. This non-distorting mirror offers 1X and 5X magnification options. 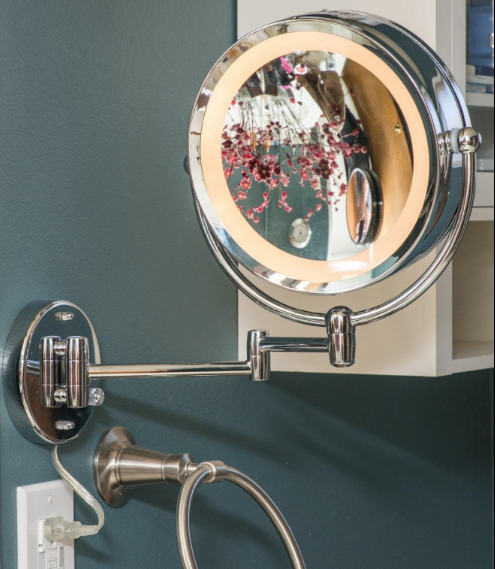 The extension arm and smooth rotation adjusts to all angles for a dynamic point of view Wall mount mirror with a 14" extension. The most obvious perk is, of course, the fact it is mountable on a wall. With all the different makeups and cosmetics there is not much space for a mirror on a small counter. You also don't have to worry about it getting knocked over. The chrome finish adds to its sleek, modern appearance. The exterior does matter (whoever said don't judge a book by its cover wasn't buying a mirror). Plus of course the chrome protects the mirror from moisture and condensation which makes it durable. You should know Jerdon offers a one-year warranty to protect against faulty material or workmanship. The fog-free design offers a huge advantage especially for those placing the mirror in or near the bathroom. It comes with optional halo lighting which you can switch on/off using the rotary knob on the oval base. They also add in a 25-watt replacement light bulb. When it comes to mounting, with a drill and screwdriver you will be done in just 10-15 minutes. The cord is about 18 inches long and stretches to about 3 feet. Many find the size just right. You could shorten or extend the cord to your liking. It is not battery powered. This is only a con for those who don't like cords and without nearby sockets. Otherwise, it's something you can live with. It is also not as bright as most lighted mirrors. However, some people love it this way as it is not blinding. Plus if your room is well lit this might not be a problem. You could also replace the bulb with an LED one. The mirror comes with various features to make you feel like you are in a luxury hotel and not your home. This is definitely a plus. If you can withstand the few downsides, go for it! The Ovente LED wall mounting mirror is bound to make your mornings easier. You can go for the 9.5 inch or the 7.5 inch one. You also have three colors to choose from-polished chrome, nickeled brush and Antique Brass. It has 1X and 10X magnification. The arm extends 12 inches from the wall. It comes with a 1-year limited manufacturer warranty. The Ovente lighted mirrors are quality. From the optical quality to the diffused ring that minimizes shadow. It does have a detailed curvature and is distortion free. Its 360 degree swivel rotation adjusts to any position you need because of its unique internal wiring. It has a long lasting built-in white LED surround bulb so guess what? No need for bulb replacements. The LED surround bulbs provide clear visual color and equal light distribution. And remember they are energy saving so they last pretty damn long. You can adjust brightness using the dimmable function. You can use an adapter (they do include a Universal 2-Port USB adapter) or you could opt for 4AA batteries which are unfortunately not included. The batteries give you a cordless, clutter-free option while the USB adapter allows you to use the mirror while charging your phone. You decide what makes you happier! Installation is easy. It shouldn't take more than 5 minutes. All you need is a drill and drill bit, hammer, screwdriver and (just in case you are OCD) a lever. They add in an instruction manual for help with proper handling and also cleaning. You must be within 4 inches of the mirror when using the 10X magnification. This is a bummer but after you get used to it, it won't be a problem. The fact that you have several options to choose from in terms of mirror inch and color. That makes it a better option than some mirrors with the same specs. I like the Antique Brass the most. Brass is quality and durable. It is also unique since most mirrors are chrome. The Floxite FI-615 must be one of the strongest magnifications around-15X! Well let me warn you, at first it will be terrifying, and that's an understatement. 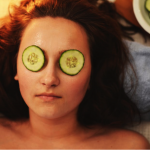 Seeing all those spots and hairs on your face you didn't know you had will be shocking. But after you get over the shock and horror, you will be glad you have a mirror to show you all you need to work on. The mirror is 6-5 inch in diameter. The mirror is quality. Floxite uses distortion-free DFP glass. The 55-watt bulb is easily replaceable. It adjusts to any angle. You won't believe the mirror detaches and unit folds up for storage or travel. The Floxite FI-615 folds flat! 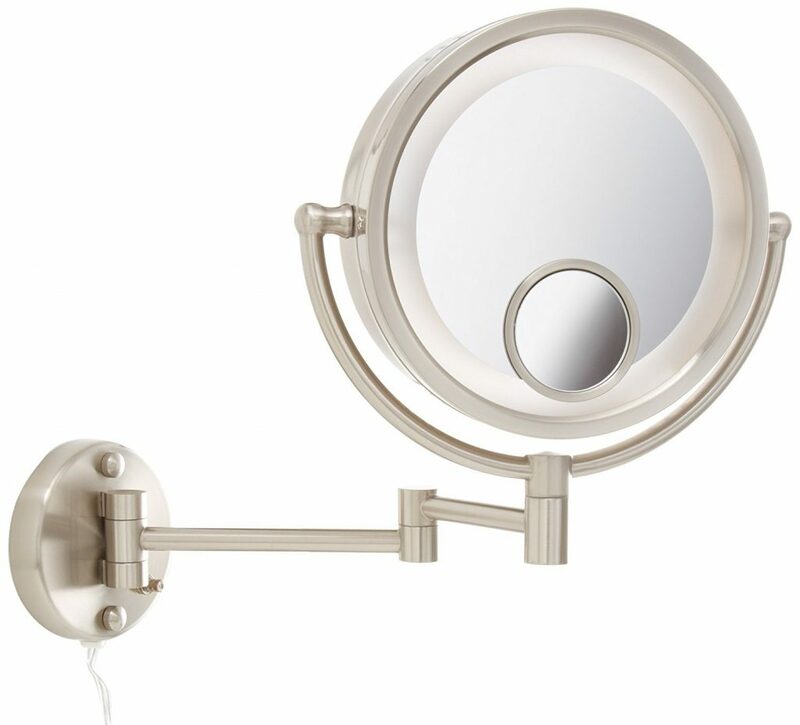 The base of the lamp is sturdy but its hinges allow the mirror to move. The cord length is short which I consider a plus because there is no extra cord hanging off. This mirror can last more than ten years. For a mirror that's a lifetime and a half! Light comes only from the bottom so you need decent lighting from above. Also the small replacement parts are not readily available. If you need a mirror to complement your other mirrors go for this. 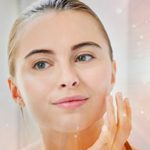 It's ideal for probing, squeezing, locating hair on your face, and plucking but for stuff like applying makeup. It can also be for those with such poor eyesight they can't see their hands in front of their face with the glasses off. 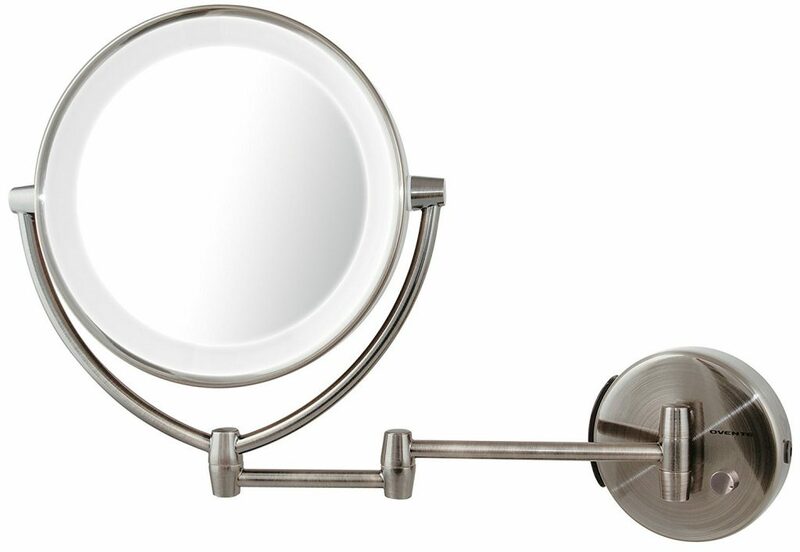 The Jerdon HL8515N﻿ mirror looks classy with its nickel finish. It provides a sleek and modern design, and it's a plus if it matches your bathroom fixtures. 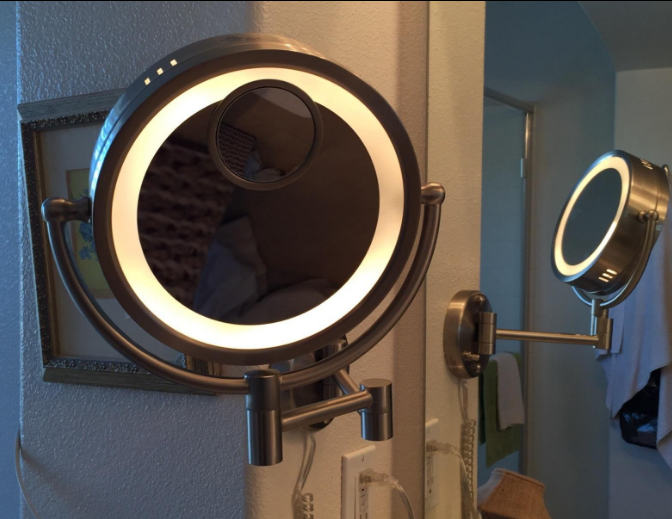 That must be one of the coolest things about this two-sided circular mirror. It has three magnifications-1X, 5X and 17X magnification but you should note the 15X magnification is built into the 7X. Some people think the 15X gets in the way sometimes making it bothersome, but I believe that it's a handy touch. The Jerdon HL8515N is quality. It is fog free. 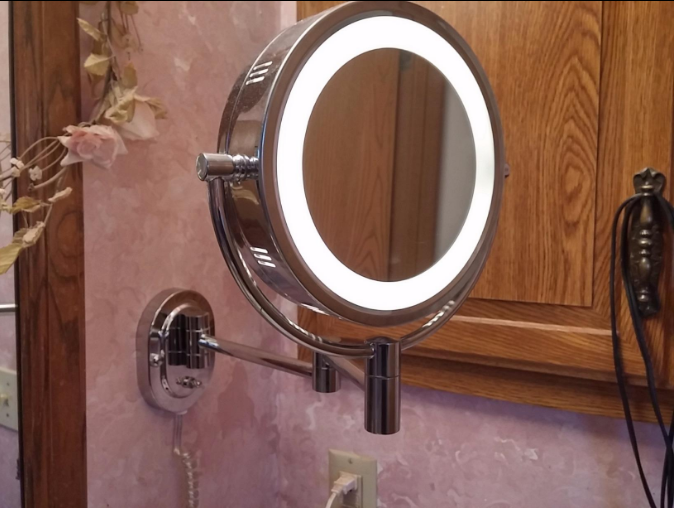 There is an on/off rotary knob that activates halo lighting around the perimeter of the mirror when you need it. The extension arm and smooth rotation adjust to all angles for a dynamic point of view. This Jorden model extends up to 13.5 inches but you can still hold for odd angles. You should know this model is not hardwired. It uses a cord that can stretch up to 4 ft. It makes use of 25-watt replaceable bulbs which is better than those irreplaceable bulbs where you have to get rid of the whole mirror is something happens. Comes complete with mounting hardware which makes mounting easy peasy. All you have to do is mount a base plate to the wall using anchor bolts first then attach the mirror to the base plate. The LED lighting is not as bright as you would expect to make it for night time makeup only. If you don't have other mirrors or if your lighting isn't as bright, don't go for this model. Try it out if you have extra mirrors or you plan on installing additional lighting. Other than that, it's a pretty impressive lighted mirror. Classy is an understatement when it comes to describing the Fluorescent Coolite. It is a two-sided mirror- 8X on one side, regular mirror on the other. The Diameter is 6.5 inches. What is there to love about it? The mirror is optical quality (wouldn't have found its way to this top ten list if it wasn't). There is no blurring. The lighting? Perfect. Not bright enough to blind you but quality enough to be glare free. The bulb is replaceable although it can go for years without needing to replace the bulb. Adjustable angle for easy viewing and swivels well (360⁰). The manufacturers deserve extra points for mobility and adjustability are good. A Stainless steel base is not only quality but long lasting. Everyone who buys it raves about how stable and sturdy the base is. The small footprint ensures it doesn't take up too much space on the small vanity desk. There are only three things I did not like about this mirror: the diameter is just too small; we need more viewing space. Secondly, the fact that it isn't battery operated means it always requires a cord. Lastly, this model is not as long lasting as other models in the market. If you have other mirrors and need an extra mirror that has magnification to compliment, go for it. It is less expensive than other mirrors which means it offers more for its price. You can live with the fact it isn't battery powered if you have sockets nearby. If after all that you are still finding it hard to decide which lighted mirror to buy let me offer some help. The Simplehuman is by far my favorite. So far I have not found another hands free mirror. You might think that’s a minor feature but wait till you have your hands full with brushes and makeup. I am also in love with the Tru-lux LED light system that mimics natural lighting. What better way to know if your makeup will look great out in the sun than with a mirror that resembles the outdoors? Not forgetting you have the option to choose between a table top and a mountable mirror. However, if you can’t afford the money, go for the Jerdon HL65C. It is quality yet not as expensive as the Simplehuman. Granted it doesn’t have a sensor and natural lighting, but it’s the next thing with its soft halo. It’s also great that you can choose between brass, bronze, chrome and nickel. If you are always on the go, get the Zadro as it’s easy to package with little risk of damage. Make the smart choice today! 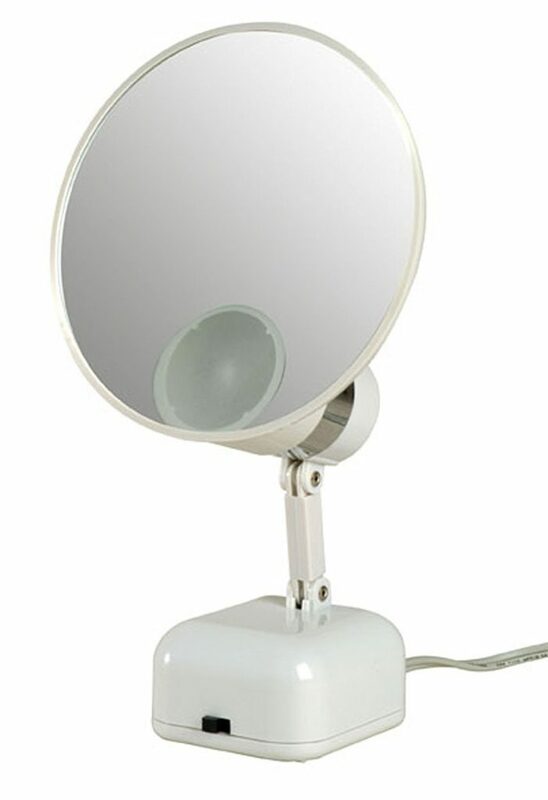 Hello the first makeup mirror looks very elegant. I love it. But the video seems can not play. Anyway thanks for your very detailed sharing!